Freedom Network [FN] has called on leadership of Pakistan Muslim League (Nawaz) and Pakistan Tehreek-e-Insaf (PTI) to restrain party activists and supporters from attacking media-personnel, especially those working for TV channels, who are covering the two sit-ins (dharnas) and public rallies in Islamabad and other cities. “We are extremely concerned at reports that journalists covering sit-in of PTI in Islamabad and rallies of ruling PML (N) supporting Prime Minister Nawaz Sharif are coming under attack from activists of both parties,” FN, Pakistan’s first media watchdog organization monitoring freedom of expression, press freedom and online freedom said 26 August 2014 (Tuesday) in its press freedom alert. It said the leadership of PTI and PML (N) were under obligation to protect press freedom and freedom of expression and attacks on journalists doing professional duties to let the nation and rest of the world know every detail of the sit-in and the government’s response to handle the situation responsibly. The channel is not accessible in “70 per cent areas” where people watch the country’s private TV channels through cable network system, according to the channel management. As latest as August 24, 2014, Aaj News channel’s cameramen and assistant producer were attacked in Islamabad and of them is taken to hospital for serious wound. “Assistant producer Usman Aurangzeb and cameramen Usman Ghani and Muhammad Iqbal and DSNG support staff ahsan Gill were attacked by PTI activists,” a report on website of Business Recorder said. On August 21, 2014, activists of PTI harassed Farhat Javed, a female reporter of Geo News channel, in D Square by throwing empty bottles and batons at Geo TV’s DSNG van. Imran Khan’s party is agitating against the federal government at the Parade ground. The harassment of the female journalist and other crew members took place when the channel’s management told Imran Khan about the problem and he asked his supporters to let journalists cover the protest without any fear. The harassment comes two days after the PTI chief, Imran Khan, condemned the manhandling of Geo News and staff of other media houses and directed his activists to refrain from such activities. Samaa TV reported that PTI activists allegedly seized DVD containing video of female activists being harassed and abused during the sit-in. “The DVD was seized from Samaa crew by some PTI activists,” the Samaa report, shared on social media, said. With Pakistani media sharply divided over the issue of joint protests in Islamabad coverage of the protests by different channels also brings pressure on reporters in the field from opposing political parties. Geo News appears more critical of Imran Khan while ARY News seems as supporting Imran Khan against the government. As a result the channels’ on-ground reporters get harassed, attacked and abused, FN press freedom alert noted. ARY News reporter Babar Malik was attacked while covering ruling Pakistan Muslim League (Nawaz) rally in Faizabad in Rawalpindi district on Thursday (August 21, 2014) when activists of protesting party attacked him. “First the angry activists abused the television channel and its anchors, and then they started beating me. Although I was not injured seriously, I suffered various bruises,” the journalist was quoted as saying. Local leaders of the ruling party, Hanif Abbasi and Ziaullah Shah, reached the scene and rescued the journalist. 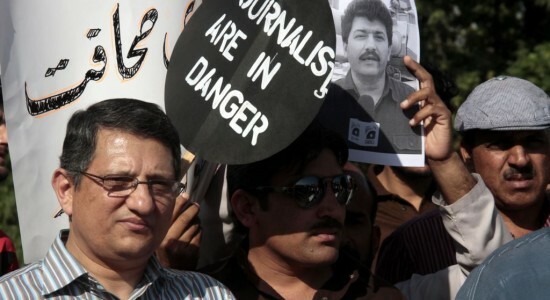 “We demand the government to provide security to the on-duty journalists as they cannot perform their duties under such circumstances,” he said. Both ARY News and Geo News have complained of being censored in many parts of Pakistan with their transmissions being taken off cable networks. ARY News said its transmissions were “suspended in various cities of the country” on Tuesday (August 21, 2014) for broadcasting minute-by-minute updates of the protests. A report on its website read that ARY News transmissions were forced shut in different cities of Sindh including Karachi, Hyderabad and Nawabshah, for reporting the protests live from Islamabad. ARY News said a couple of days ago, ARY News transmissions were suspended in many cities of Punjab, including Lahore, Rawalpindi, Multan and Islamabad. “Our viewers and readers expressed their serious concerns on the social media and referred to this move as an attack on the freedom of speech,” ARY News claimed. Geo News has aired similar complaints saying its transmission was not restored in most of the areas, including military garrisons, of the country despite the Supreme Court order. Geo transmission in across Pakistan is intermittent since the channel aired allegations by Hamid Mir’s family, after an assassination attempt on him in Karachi on April 19, 2014, that the country’s spy agency Inter-Services Intelligence (ISI) chief orchestrated the attack on him. The military denied these allegations. The military is avoiding inviting the Jang Group staff to any official briefing or social gathering accusing the channel of “being anti-state.” The allegation the group denies. Biggest security threat Jang Group staff members are facing from public announcements by Imran Khan in his protest sit-in which senior journalists fear may temp party workers to invoke violence against journalists working for Jang Group. “Creating hindrance is against freedom of press and freedom of expression,” former Pakistan federal Union of Journalists general-secretary Mazhar Abbas told FN. He said political leaders should not use public meetings to vent anger against one media group or another as charged party activists could harm journalists working for targeted media houses.